Bee communication is primarily based on pheremones. In particular, the order to "attack!" 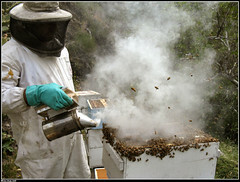 depends on the attack pheremone -- what smoking a beehive does is make it so they can't smell their pheremones. They therefore never get the order to attack (though individual bees may still make the decision on their own).